If you have ever read about living off the land and escaping the craziness of modern life, you may have come across the concept of off-grid living. More than 200,000 Americans have unplugged and chosen to live more sustainably through the off-grid lifestyle. Off-grid living can be a steep learning curve. This is a guest post by Ross Burgess. 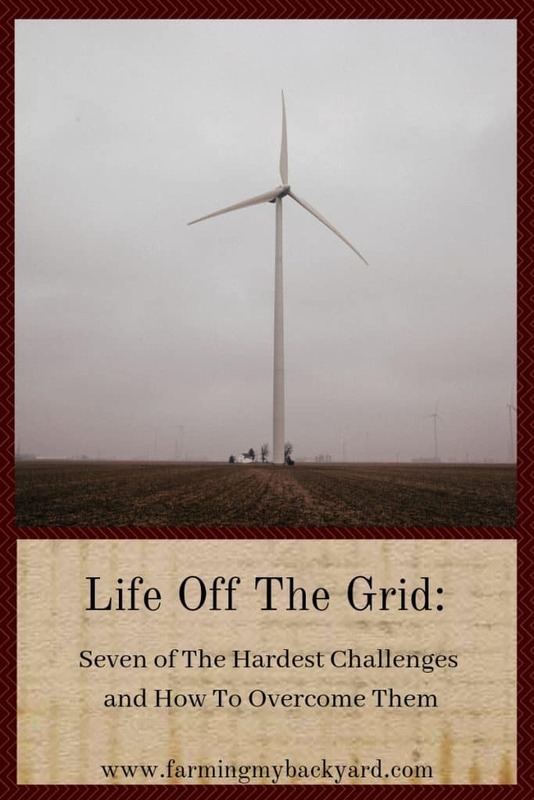 Here are the seven hardest challenges to life off the grid and how to overcome them. Location isn’t only a priority for city dwellers; it matters to off-gridders too. Many suburban areas won’t allow you to live in a house without utilities, so you need to locate land that is rural enough to avoid these legal limitations. Consider how much land you’ll need to sustain your lifestyle. If you are planning on raising livestock, you will need enough land to store their feed, give them shelter and let them graze. You’ll also need access to a reliable water source and enough space to set up your garden and install a waste management system. Although you can live completely off the grid without power, having a power source does make off-grid living a little easier. Most off-gridders opt for a solar energy system because it is generally considered the best long-term investment. However, there are many different alternative energy sources available depending on your budget, location and energy needs. Check your current power bill to see how much energy you consume and use this as a baseline for the type of energy setup you will need. Once you have your power source established, you may find you are consuming more energy than you have available. To help conserve energy, only run one appliance at a time and try to do so during daylight hours to make the most of the solar energy. Use a wood stove for heating and try to use gas for the stovetop rather than electricity. Producing your own food is essential when living off the grid. Establish a kitchen garden on your property that you can slowly expand, so you’ll produce more than you need and generate extra income to offset the cost of homesteading. One of the biggest challenges at the beginning can be finding enough variety for a balanced diet. Not all homesteaders can raise livestock within their first few years, but with careful planning, you can produce enough excess vegetables that can be traded for things you can’t provide yourself. Learning to cook from scratch and preserve food are also essential homesteading skills you must learn to ensure you’ll have enough food during the off season when your garden is less productive. Hunting is another skill that can prove useful for those living off the gird, as is learning to butcher game using a tactical knife. A close, reliable water source is critical. Without water, there will be no harvest, no livestock and more importantly, nothing to keep you alive. Of course, land located by a large freshwater source can be difficult to come by, so most off-grid homesteads manage by boring a well and using hand pumps to draw water as needed. Running water is one of the things newcomers tend to miss most, but if you have a generator, you can have a limited amount of running water available, so long as you don’t mind spending money on diesel. A great way to recycle your water and ensure there is plenty of it is to set up a greywater system that uses waste water from the kitchen and laundry to irrigate the garden and flush the toilet — if you aren’t using self-composting toilets. The last thing you may need to consider when it comes to water is whether you have the right to use the water on your land. If you have a water source on your property, you can generally use it for personal consumption. However, if you need the water for livestock or crops, consult with a lawyer before purchasing your land to make sure you have the legal right to access it. The work you’ll put in to live off-grid is equivalent to multiple full-time jobs that require expert time management skills to ensure everything runs as smoothly as possible. Procrastination has no place in off-grid living; seeds need to be sown in season, animals must be fed and milked on regular schedules, shelter and fences are needed to keep out predators and overabundant harvests need to be preserved for colder months. Finding enough time in the day means you must become an early riser. And to make the most of your homestead, you must consistently plan months — sometimes years — ahead. Keep detailed records of weather conditions, harvests and livestock birth rates to refer to when making your plans. Simpler living does not necessarily mean cheaper living. Living off-grid is often romanticized, and newcomers can forget the significant upfront investments as well as the ongoing costs of raising livestock and growing crops. Setting up your power source is usually the most significant cost you’ll incur. Depending on the size of your land, home, family and energy needs, you may need anywhere between 15 and 30 large solar panels to provide enough power to run your home as well as a generator for backup power. This can set you back tens of thousands of dollars. If you can’t make a large upfront investment, small steps are the key to establishing an off-grid lifestyle while spreading out the cost. Start by growing and cooking your food, reducing your carbon footprint with a no-waste policy and becoming more mindful of your energy consumption. Taking small measures before committing to a fully off-grid lifestyle can help you save money to put toward your setup and help you adjust to the off-grid mindset. The final and most overlooked challenge you may face is a lack of human interaction. Living off-grid can be a way to escape the hustle and bustle of city living, but homesteading is easier when you have a group of like-minded people to share the workload. Off-grid living attracts interesting people to small, close-knit communities. If you aren’t already part of an off-grid living community, there are many groups you can join online that welcome anyone curious about off-grid living. This is a good place to start to find people in your area who you can trade products or services with for things you can’t produce yourself. Experienced off-gridders can also give you advice on sowing and harvesting times, local vets for your livestock and any off-grid legal issues you may encounter. Living off-grid is incredibly rewarding but can be a difficult transition for newcomers. By doing your research, starting small and making minor changes toward sustainability today, you can overcome many of the biggest challenges of off-grid life. Ross Burgess is the business operations manager for eKnives. When he’s not working or writing about life off the grid, you can find him hunting, hiking the trails, or spending time outdoors with his wife Linda, and their dog Rory.